Egypt’s economic reform programme is due for its fourth review by the International Monetary Fund (IMF) this month, with a delegation scheduled to visit Cairo soon to check whether the government is implementing its promised reforms. Once the country passes the review it should receive the fifth tranche of a $12 billion Extended Fund Facility (EFF) with the IMF signed in November 2016. So far $8 billion has reached Egyptian coffers. Over the last two years, Egypt has passed all the IMF checks with flying colours, and the Egyptian economy is often mentioned by international financial institutions as an example of best practices. The IMF’s October 2018 World Economic Outlook (WEO) report released at the fund’s meetings in Indonesia recently said growth in Egypt was projected to rise to 5.3 per cent in 2018 and 5.5 per cent in 2019, up from 4.2 per cent in 2017. The figures reflect a recovery in tourism, rising natural-gas production, and continued improvements in confidence due to the implementation of an ambitious reform programme, the IMF said. 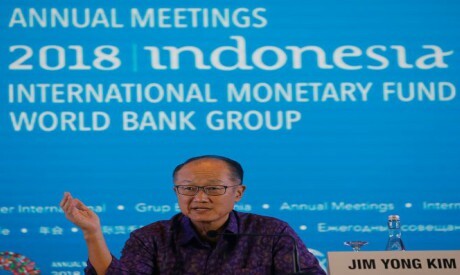 Jim Yong Kim, World Bank Group president, speaking at the bank’s 2018 Annual Meetings in Bali also pointed to Egypt as a country where reform is helping to improve human capital. “Egypt has reduced regressive energy subsidies to make human capital investments across the board,” he said. Cutting fuel subsidies has been an integral part of the country’s economic reform programme since 2016. Kim stressed that the Egyptian government had spent more on energy subsidies than on healthcare, education, and social protection combined. The reform programme had allowed more resources to go to cash-transfer programmes for 9.5 million people and had increased food subsidies for the poorest by 300 per cent, he said. He also said the Egyptian government had expanded its school meals programme to cover 12 million children. Maintaining the momentum of the reforms is also important in the face of external pressures, among them escalating oil prices. Brent crude has surged to more than $80 per barrel, whereas Egypt’s 2018/2019 budget assumed an oil price of $67 a barrel. The issue was highlighted by President Abdel-Fattah Al-Sisi during a military seminar last week when he said that oil prices had doubled over the past eight months from around $40 to around $80 per barrel. Each dollar above $67 translates into LE4 billion additional expenditure on an annual basis, according to Mohamed Badr, senior director at NGage Consulting, a management consultancy firm.If the price reaches $90, it will mean that the government will have to double the subsidy to around LE180 billion, he added. The government had allocated LE89 billion for fuel subsidies in its 2018-19 budget. However, the negative impact on the budget of rising oil prices has been milder than expected, Finance Minister Mohamed Maait has told investors, according to Enterprise Press, an online news service. Maait said the rising price of oil had led the treasury to overshoot its fuel budget for the first quarter of 2018-19 by only LE1 billion. He said the lower-than-expected figures had largely come from a decline in the consumption of fuel, especially diesel, which had balanced out the price hikes. Nonetheless, Badr believes that if the government wants to achieve its budget deficit target, it will have to cut subsidies before July 2019. Its budget deficit target for the current fiscal year is 8.4 per cent. One thing that could ease the situation, according to Badr, is the output from the Zohr Gas Field, especially since the oil minister recently announced that Egypt would no longer be importing gas at a saving of some $3 billion annually. If Egypt resumes exporting liquified natural gas (LNG), it will increase its revenues, helping it to pay for oil imports and maintain the targeted budget deficit, said Badr. However, oil prices are not the only risk Egypt must contend with. “The economy has been progressing towards stabilisation, but downside risks remain evident through high external debt and the instability of financial inflows that could be at risk in an environment that has become more challenging for many emerging markets against the backdrop of continued rate hikes in the US and increasing capital outflows,” said one economist who preferred to remain anonymous. Since the emerging markets crisis began, foreign holdings of Egyptian debt have fallen. According to Central Bank of Egypt (CBE) data, foreigners’ investments in Egyptian treasury bills saw net purchases of $6.5 billion in 2017-18 against $10 billion the year before. Worried investors have preferred to divert their investments towards markets offering higher interest rates. US debt has also become increasingly attractive following the Federal Reserve’s hike in interest rates. At the end of September, it increased rates for the eighth time since December 2015 to up to 2.25 per cent, levels not seen since April 2008. Badr stressed that foreign holdings of Egyptian debt did not finance the overall budget, and they were not part of the hard currency reserves, which mainly consist of improved receipts from tourism, remittances from abroad, and Suez Canal revenues. According to the latest data from the CBE, tourism receipts for 2017-18 reached $9.8 billion, more than double the figure for the previous year. Suez Canal revenues came in at $5.7 billion, compared to $4.9 billion the previous year. Remittances from abroad came to $26.4 billion, up from $21.8 the year before. A continued commitment to structural reform in support of private-sector growth and improved competitiveness is important for sustainability, the anonymous economist stressed. However, the Egyptian Centre for Economic Studies (ECES), an NGO, while admitting that the high growth rate of the Egyptian economy was undeniable said that this growth must be sustained through dependence on productive sectors, not only revenues from tourism, oil and gas exports or remittances, so as not to be prone to external shocks. In a note released this week, the ECES said the dependence on productive sectors was important to ensure sustainable GDP growth and resilience to internal and external shocks. It also stressed the need for the equitable distribution of the fruits of growth to different regions and groups to avoid the pre-2011 situation when GDP growth rates were estimated at about seven per cent in 2007 and 2008, but the fruits of development were not felt by all. Another setback to worry about is inflation, which rose in September to 16 per cent compared to around 14 per cent the previous month, according to the Central Agency for Public Mobilisation and Statistics (CAPMAS). The month-on-month rate increased to 2.5 per cent in September from 1.8 per cent in August. “Inflation is too high, with an adverse impact on the most vulnerable groups demanding more targeted social support,” the economist said. Although inflation had been cooling off since January, it spiked again earlier this summer on the back of another wave of fuel subsidy cuts. Should the government decide to hike fuel prices again this year, this would hit many people hard. The cabinet has denied that there will be any new increases in fuel prices this year. “The erosion of consumer spending power could halt the momentum of growth if not enough efforts are made to ease inflationary pressures and structural reforms are not implemented to address market bottlenecks and monopolistic powers that distort market distribution,” the economist said.